"Super sexbots... built to kill!" From the studio that brought you Corman's Poe adaptations comes this delightful and hilarious parody of the secret agent genre. Vincent Price stars as the mad Dr. Goldfoot (so named for his choice in shoes, like Bond's Goldfinger) who with the help of his badly revived undead assistant is planning to perpetrate the perfect crimes! With his irresistibly beautiful bikini clad robots they will gain access to the most wealthy and powerful men, robbing them blind. However two inept secret agents are on his trail, played by Frankie Avalon and Dwayne Hickman, can they stop him before it's too late? 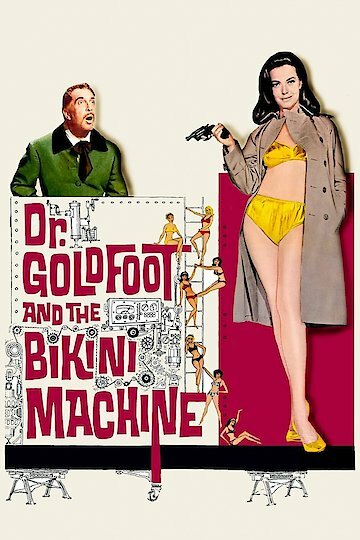 Dr. Goldfoot and the Bikini Machine is currently available to watch and stream, buy on demand at Amazon, Vudu, iTunes online.